Representative Murtha, a Democrat from the Commonwealth of Pennsylvania passed away Monday at the age of 77 years due to complications from gall bladder surgery. He was a veteran of the Korean War and an outspoken opponent of the War in Iraq. A lifelong Democrat and ally of Congressional leaders of his party, Murtha was the chair of the House Defense Appropriations Committee. Along with the loss of a great public servant, the Democrats find themselves mourning the loss of a powerful member of their House majority. Pennsylvania law states that a special election will be held no more than 70 days from now. It is likely that the special election will be scheduled for the same day as Pennsylvania’s primary, May 18th. 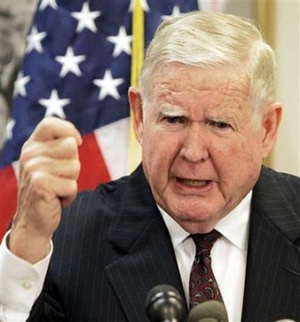 Murtha was strongly challenged in 2008 by Republican William Russell, a veteran of the Iraq War. He will likely run in the special election, hoping to take the seat that he nearly captured 18 months ago. His passing will leave Democrats in a tough spot, trying to take an open seat once held by a deceased and long respected member of their party. If the Commonwealth of Massachusetts is any barometer, this seat too will be captured by the GOP. ← Narcissism Week on Facebook!